The Caves’ fathers always welcomed everyone who came to the monastery on the Kiev hills to worship the great sanctuaries and to find the answers to the spiritual questions as well as the sense of peace in their hearts. Continuing the ancient hospitality tradition, the brethren always welcome all pilgrims and parishioners with joy. The guests of the Lavra with different incomes are invited to stay at the Houses of the Pilgrim. 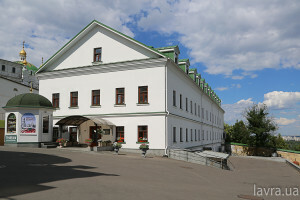 Hotel rooms are located on the territory of the historic Guest House in the buildings of the monastery No. 58, No. 54 and No. 56. They differ in the possible number of people in the room, the level of comfort and the availability of room facilities. The monastery brethren scrupulously keep order in the guest rooms, the daily regimen and the observance of the residence rules, since the Houses of the Pilgrim are located on the territory of the most ancient monastery of Holy Rus, and living in such a place implies a careful attitude. If necessary, this is reminded with understanding and care, so that the peace in a person’s soul received in the Holy Caves monastery would remain and would be preserved. For those wishing to stay in the Lavra guest houses, we remind of the necessity to book a place in advance by the specified contact phone number, and upon arrival at the Lavra, to follow the established rules of behavior and daily regimen. The Pilgrim’s House (housing 58) is located at the entrance to the Kiev-Pechersk Lavra (monastery). The path to the Lavra Pilgrim House goes through the right arched entrance of the main monastery gate, not far from the final public transport stop, which takes passengers to the Lavra from the city center. The renovated Lavra building No. 54 is open to welcome Christians who come to worship the shrines of the monastery, and is located opposite to the Joy of All Who Sorrow Church.